While recuperating from the pedestrian accident last month, decided being homebound was a good time to sharpen some photo editing skills, maybe even learn a new technique or two. After downloading images from the camera to the computer, the editing process begins with questions: First, is there a good composition within the raw photo that can be brought out? Is the subject matter interesting or attractive? If not an interesting subject, can it be a good abstract design? What do I want the viewer to see or look at? Does the image suggest a certain mood, feeling or attitude? Any details that need to be brought out? Any technical flaws needs correcting? 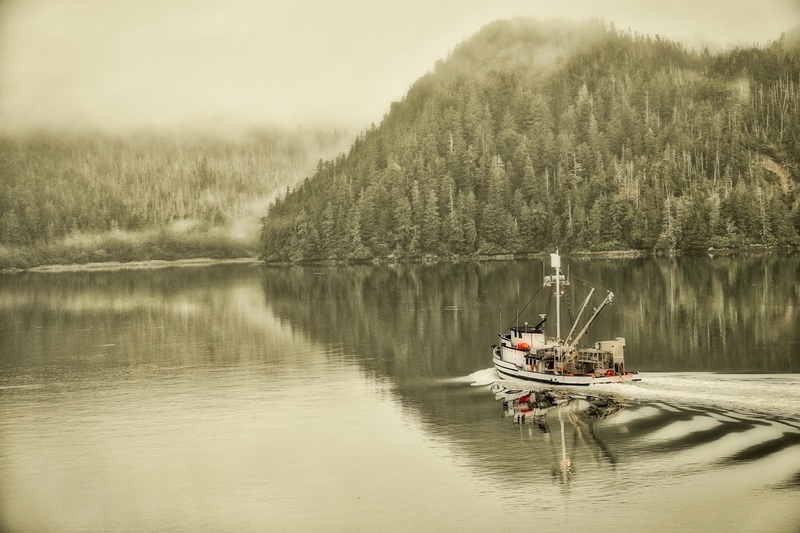 This first photo is one of eight taken all within a minute or two, pre-dawn of an Alaskan fishing boat. With the sun not up yet, lighting is dim, not much color to work with, a foggy mist, the boat was constantly moving, changing direction and position. Background details are muted and mushy. I always try to compose a photo before snapping the shutter button so the amount of cropping required is reduced. No cropping was required on this one, but editing can improve it. After removing all color except red, added a copper tint overlay then remove some of the mist from the background, the tree are now sharp without completely removing the morning fog. The far left shore is brought into play in the scene and the remaining red on the boat creates a focal point for the eyes. The feeling of pre-dawn light and ocean mist is preserved while bring out details in the image. 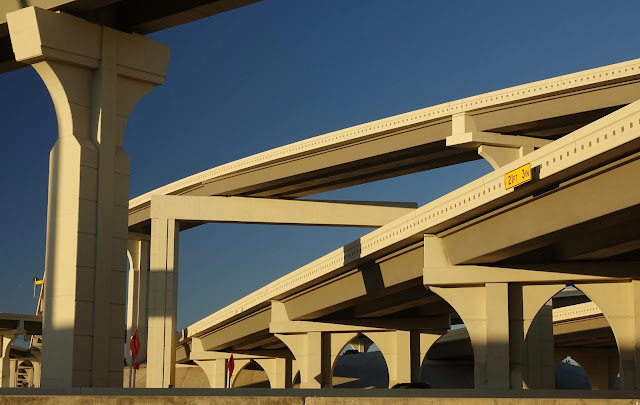 Next photo is of a new overpass in Houston, not far from home. Though the composition is good and the golden hour light warms the scene, the colors in the yellow and red signs detracted. They are not where I want the viewer to look. By converting to a black and white image, the image is now an abstract design of light and dark shapes and lines, playing off of each other, making the eye dance around looking for an anchor point until it pulls back and focuses on the image as a whole. While it first appears busy and jumbled, once you pull back and see it as a whole, it is quite simple, pleasing and clean. No cropping needed. Liked this photo from the time I first saw it in the camera. But when downloaded to the computer, the eye wants to focus on the guys face. Which is normal but not where I want the viewer to look. Plus there are several other distractions in the photo. By cropping out the electrical box, part of the menu sign and the colorful red poster, the image is now less busy. Too many items in a photo only confuses the viewer, they don't know where you want them to look. With the image cropped, could now work on improving the details and focal point. In the original, the stucco wall lacked detail yet the strong color pulls attention to it. The red in the poster attracted too much attention. 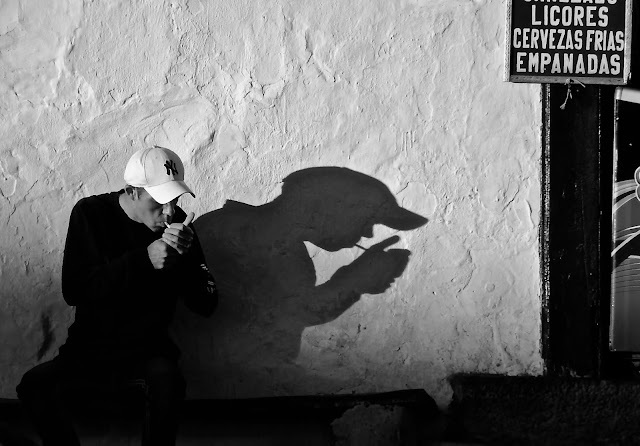 Converted the image to black and white, pulled up the wall details and enhance the contrast so the eye's focus moves from the man's face to the oversized dark shadow lighting a cigarette on a highly textured surface. The wall's texture is an important image element as it dominates the scene's backdrop adding a tactile sensation. 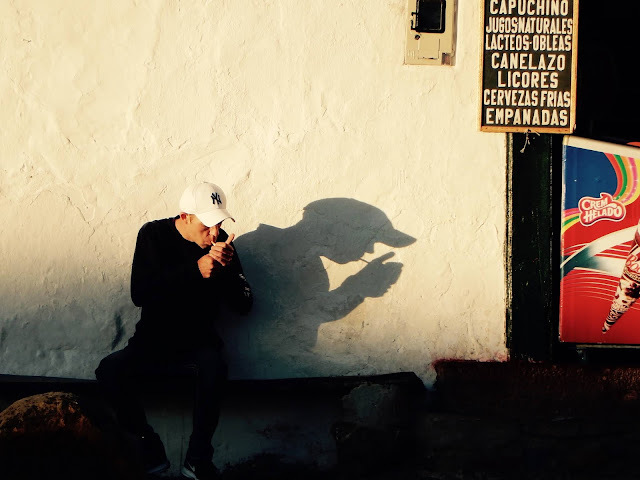 The Spanish menu sign, the rough stucco wall, smoking in public, exaggerated shadow figure all give a feeling of another country, another culture. far, far away. The image is reduced the three elements. In this next image I could see in my minds eye where I wanted it to go, but now how to get there. It took more thought and trying different approaches to finally bring out a story. First, being taken in a large open courtyard, the man is much too small to see details so cropping is needed. 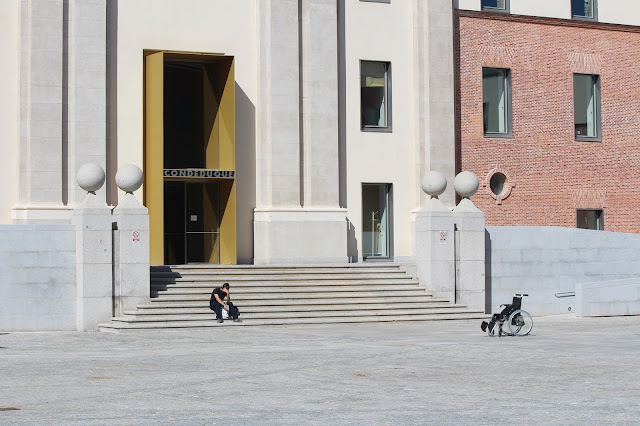 The gap or distance between the man and the wheelchair needed to be emphasized more by removing a lot of excess building. Cropping will do that. So the viewer can write their own story of what they see here, they need to be able to see the man's posture and the separation from the chair. Color was removed as the desired mood conveyed is not one of joy. The building details did not add to the story but took away attention, so color was removed. As is, the background is secondary to the story. Many times in a color photo the details in the background will overshadow the image or the focal point the photographer wants to emphasize. By removing color as an element, the background has less importance, the background details are less dominating. With the scene now set, the viewer's focus is on the only three variables in the image: the man, the wheelchair and the distance between them. The viewer will create a story in their mind as to what is going on. As you can see here, there were not major or radical changes made to the BEFORE images, making them totally unrecognizable from the original. No, editing many times is a simple tweaking, adjusting or shifting of focus to bring out the best in a photo. Every photo demands a different approach to bring out their best, to serve a purpose. Some are for telling stories, others to add details to the written narrative in the blog, still others are pure artistic expressions to appeal to the eye and mind. I have heard some comment that photos should be shown exactly as they are taken. In response to that, I'll defer to the Dean of American landscape photography, Ansel Adams. Quote, "Good photos are taken, great photos are made." The editing process starts with many questions and the finished image will either answer questions for the viewer or create new questions in the viewer's mind. It's all in the intent of the photographer/artist. Photography can be a great vocation or a great avocation, that will challenge one's mind and creativity. So many different skills to learn, so many different stories to tell. While I enjoy learning new photo editing techniques, polishing old skills, pushing the photo images in new directions, they still only reflect what happens in life out on the road. Am getting cabin fever not being able to ride. So to appease the wandering mind, have been making riding plans for this summer. What repairs or servicing needs to be done to which rig? Ride safe, ride far, hope to see you on down the road. You've been putting in the thinking on these pics! 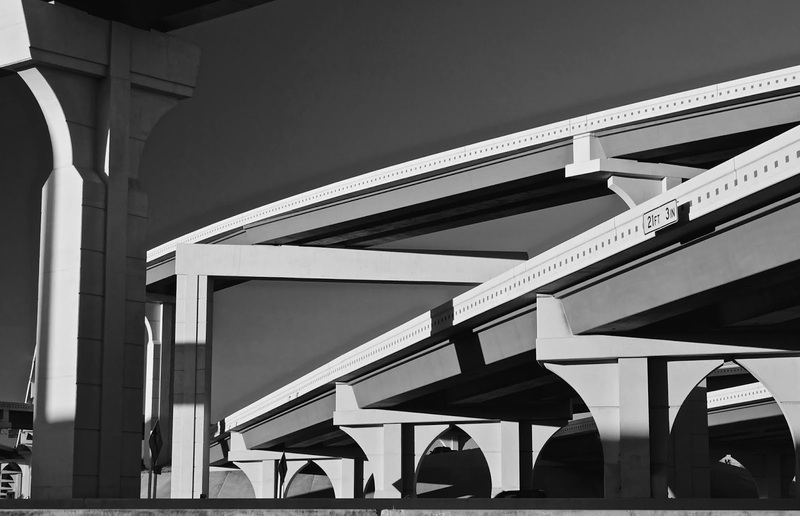 I like the way the highway overpass pic once you made it B&W! By the way, you see a shot where I would have just scanned and continued onwards.....I think I might be missing stories. Thanks Dom, we all see the world differently based on our experiences and our upbringing. You, by experience, almost instinctively know now when a particular sunset will produce either a so-so or a great photo. That comes from taking many, many so-so photos. I know. Have taken more photos that are not usable than taken good ones. With today's digital cameras, it costs nothing to shoot as many photos as possible. Discard 100's of so-so shots to get that one great shot. Am discovering that the more simple shots, with fewer elements, fewer distractions, but sharper details are actually stronger than broad overly complex multi-layered images. You have a good eye for photography Dom, keep playing with different images and angles. Every once in a while, turn around and look for a interesting image behind you. Well done! I hope to get on the road in early May, ride up to the Arctic Ocean in both AK and the NWT. Will make a stop in Valemount,BC on the way up, see my friends Bob and Janey. Could meet you there if you're headed north, amigo. Early May eh? Get there too soon and the passes will be snowed in yet. Sounds like my kind of great adventure. Had the first visit with the chiropractor today. Says he will start working the edges and slowly get to the core problems caused by the accident in the lower back and leg. Hmmm, doesn't sound like a one or two week process, me thinks. In month or two will know what, if any riding plans might be for May. Northern Idaho late July is marked on the calendar for the national sidecar rally. Before and after that rally is still questionable. The sidecamper still needs some work done on it before a new adventure is taken. Don't count me out, but not in either, just yet. Jan, amazing skills as always. Quick question - when you choose a photo to work with, do you have a plan for where to go with it, or do you kind of play with the tools (color, cropping, filters) and see what you can make of it? The greater, implied question is - do you have a gift from God or is there hope for us mortals?? Thanks Jerry, will to answer your question with an example; Over the weekend I came across a youtube video explaining the differences in the "Marimba vs. Xylophone vs. Vibraphone vs. Glockenspiel". Coming from a talented musical family, I love great music of all types. Watching the video, at first I didn't understand why the high tones he said he was playing were silent. I was hearing nothing. Thought to myself "hit the mallet harder". He heard the tones, many who watch this video will hear the tones. I was reminded I don't hear many tones. My normality is a world with fewer tones than maybe yours. Which explains why not only I am not a talented musician, I am not a musician of any kind. I can't hear many tones and the ones I do hear are off-pitch according to my third grade piano teacher. 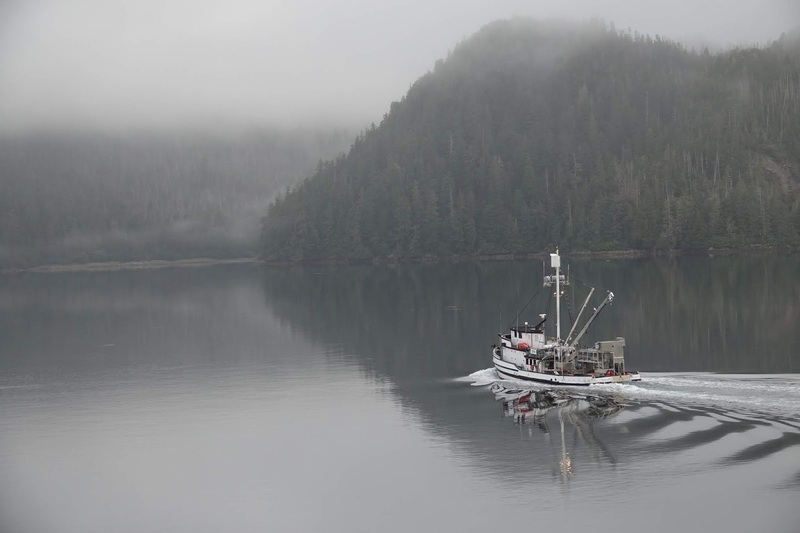 On the same note (a pun), how many cannot see the RED I mentioned in the fishing boat photo. Many people are color blind to certain colors or tones of color. Is the red I see the "right" red" or is it a red that looks like black? What we see and how we interpret it determines much of our riding style. Think about it. You and I don't see the road the same way yet we can both ride motorcycles safely.... or at least you can, Jerry. Your beautiful wife Susan can see in her minds eye the beauty she can create out of that old discarded piece of furniture she buys today. She may not know exactly which approach she will use to bring out the beauty of the wood, but she knows the beauty is in there somewhere. Why did she buy that particular piece and not the other table? She saw something in it. Can you see what she sees? Even the most expensive and most high tech cameras of today have their limitations. The camera cannot see what our eyes see, so we must post-process the image to bring it back to what we saw when we took the photo. And then maybe even enhance the photo some if it helps to tell the story. So yes, many times I can see a better image waiting to be brought out of what the camera captures. Everyone of us has been blessed with strengths and weaknesses, talents and deficits. As I have told my sons many times, the secret to a fulfilling life is to discover what you are good at and pursue it. "Love what you do so much you would gladly do it for free. Do it so well that people will gladly pay you for it" is a quote I believe in.